I wanted this BM to be totally about food and that’s why there is no mention about the man and the kid. But this… I have to share. The kid is too much into cricket now a days. And my knowledge of the subject is subzero. One day, he asked me whether I know how to sweep and I confidently took out the broom and started sweeping! No wonder he sticks to his dad all the time, asking more and more questions about the game. And I watch totally aware that my ‘ratings’ are going down. He doesn’t want to be ghost anymore, nor a cooker, nor an officer but a father when he grows up! Now, how is that!! 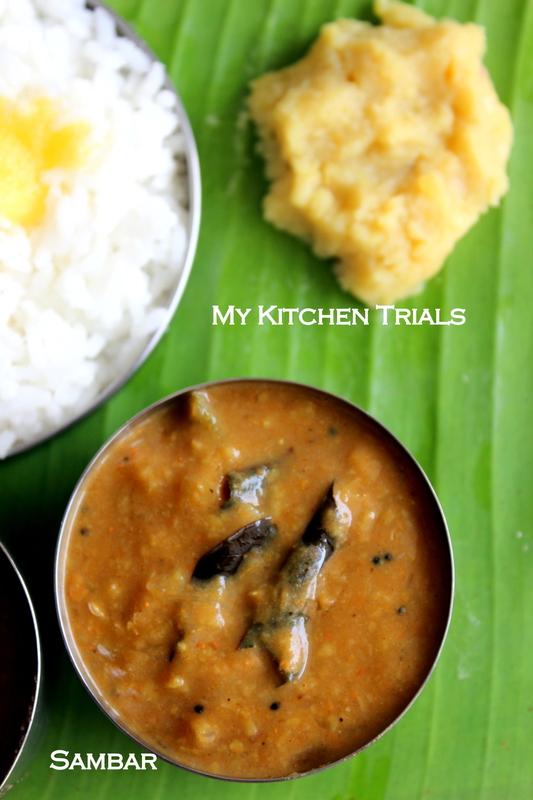 Coming back to the recipe here, its Sambar for S, the South Indian equivalent of dal. Scroll down below for the recipe and additional information! Sambar is the South Indian counterpart of dal. It’s mixed with rice and eaten with a vegetable on side. Pappad pair very well with sambar and rasam. In North Kerala side, Onasadya sambar can have coconut in it. They go for the ‘Varathu aracha sambar’ (coconut fried and ground and added to the sambar). Sambar is served right after the dal in a sadya. You can pair it with any of the side dishes and pappadam. Avial, especially, tastes very well with sambar. You can make sambar with a single vegetable as well. 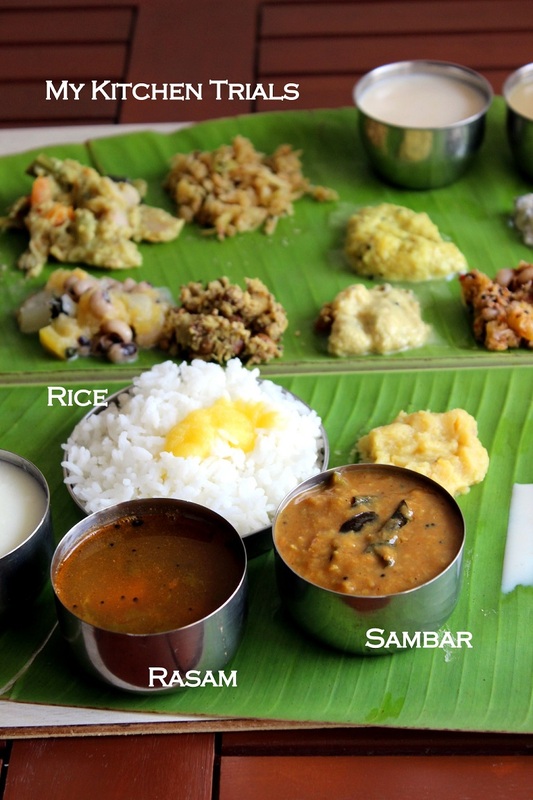 But for Sadya, usually mixed vegetables sambar is made. For a sambar, the vegetables are diced into big cubes. **Ridge gourd is not traditionally added to sambar, but I love it in dal and have started adding it to sambar as well. Coriander leaves are not added to Kerala style sambar. Adding it is common in Tamil Nadu side, though. Pressure cook the dal till done (for me, about 5-6 whistles). Once the pressure drops, mash with the back of a ladle and keep aside. Wash and clean the vegetables. Dice them into 1-2″ long pieces. I do the cooking part in Microwave, this can be done on stove top as well. In a MW proof bowl, add the diced vegetables, one cup water (or tamarind extract), 1 tsp tamarind pulp, sambar powder, turmeric powder, hing and salt. Microwave for 7 minutes uncovered or till the vegetables are cooked. This can be done on stove top as well. Once the vegetables are done, transfer them to a kadai, a clay pot or any deep pan (a thick steel pohini would do). Bring this to a boil, adding 2 more cups of water. Add the mashed dal and let it boil for sometime, say 5 minutes. Do a taste test. Add more salt, sambar powder as required. Its best to dilute the sambar powder in 1-2 tsp of water and then add to the sambar. If its too thick, add some more water. The thickness of sambar is a personal preference. If you like it thick, then reduce the water a bit or boil it for a longer time. If it ends up really runny, then mix 1 tsp flour/atta and 3 tbsp cold/plain water (water shouldn’t be hot, then you will have lumps of flour) and add to the sambar. Mix thoroughly, else you might end up with flour lumps. When done correctly, the sambar will be a homogeneous liquid without it separating into two layers (thin water on top and dal and veggies down) once its cooled down. Once the taste and the consistency is correct, switch off the heat. For seasoning, in a small pan, heat the oil. Add the mustard seeds and let it crackle. Add the fenugreek seeds and when it turns golden brown, add curry leaves. Take off the heat and add it to the prepared sambar. Mix and cover with a lid. My husband likes the sambar quite thick. The day I made the sadya, we had some unexpected guests, so the sambar was simmering for at least 10 more minutes that it usually does. So the sambar here is very very thick, which was great for my husband. I also used a clay pot for making the sambar, which makes it additionally thick. Wants to be a father – that is cute.. I guess he said that because he is a boy and not because your popularity is down!! and the sambar is very refreshing!! So cute, kids are innocent see how he replied, guess his father is his hero..Kids replicate very well wat we are na.. Sambar looks simply comforting. The kiddo is so adorable :).And lovely spread there and nice to read the difference in sambar prep in N.Kerala and S. Kerala..
OMG you are hilarious Rajani..truth be told, though I have been immensely enjoying your posts, I have been missing on the anecdotes..bring them on!…the man and the son are always so entertaining.. btw such delicious looking sambar!..I love kerala style one with loads of coconut, though I would never feel the coconut traces in it! Wonderful post. Your Son’s answer is too cute for words. He sure is his Father’s boy. 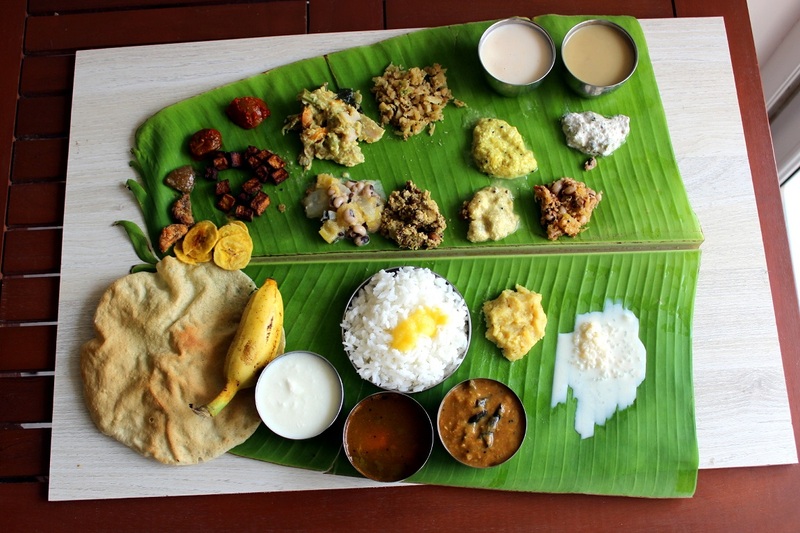 Love the father son duo talk…and the big spread….this is a different sambar..pretty thick and can’t imagine cucumber and ridge gourd in sambar…I will get over my phobias and try it when I am prepared to make a full fledge Sadya….which has to wait for a few months. Sambhar is always my favorite dish when thinks of South Indian food.. I enjoyed reading the father and son chat! mouthwatering sambhar :) looks so yummy and awesome spread dear , makes me super hungry !! love your clicks .. Funny how kids take their role models seriously! My sis used to say she wanted to be just a mom!! LOL!! Beautiful , mouth watering spread!! Delicious spread Rajani. Sambar looks so inviting. And i love your write up about your kid and hubby. Sambar looks so yummy. Lovely clicks. Rajani ratings are just that they go up and they come down. Remember the higher they go up the lower you fall. :D Was missing the man and the kids! Great sambhar. 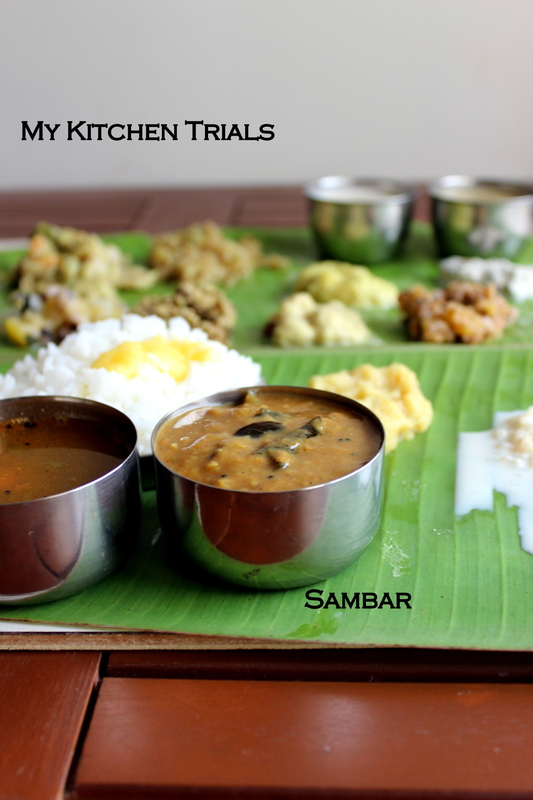 I am a sambhar fan by the way and it has to be just right. This one is to do.